The state of Alabama is a famous state in the south of the United States, and the people of the region have always been fiercely independent and proud of their own culture and heritage. Agriculture plays an important role in the country's history, which is why it was known as the 'Cotton State' to many people, while it also historically had strong associations with the slave trade. Today, Alabama is an interesting place to explore, and while it is best known for the beautiful Gulf shores and charming Southern hospitality, there are also a fair number of rather strange, quirky and interesting attractions for you to visit too. 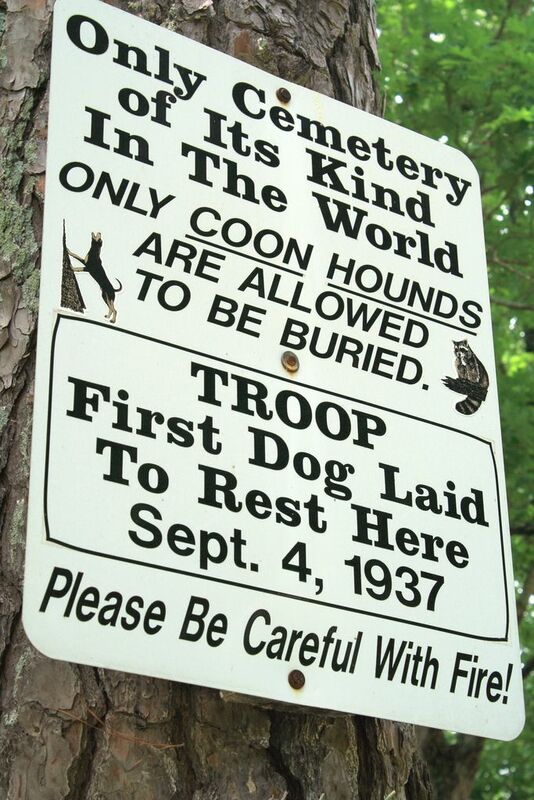 The role of the Coonhound in Alabama's history is tied to that of the hunting tradition of the state, and in 1937, Key Underwood decided to give his faithful coonhound of 15 years a more formal grave at this site in Cherokee. Over the years, other hunters have also chosen to bury their dogs at this site, and the range of ornate headstones are dedicated to dogs such as Famous Amos, Bean Blossom Bomma and Night Ranger. This museum is based on the collection of Anniston collectors Farley and Germaine Berman, who both had a passion for finding new and interesting or attractive items. One of the main attractions is the silver tea service of Adolf Hitler, which may have been recovered during Farley Berman's time in Germany during WWII. Overall though, there is an impressive collection of items including weaponry and armor which could certainly grace much larger museums than this small but interesting Anniston destination. Near the city of Montgomery, the ruined town of Spectre has more than a hint of the surreal about it, as it was actually a film set built for the fantastical movie 'Big Fish'. Much of the town has now been recovered and taken over by nature, but it is still an eerie yet almost beautiful place to explore. For anyone who has seen the film itself, and who fondly remembers the transformation in the town from idyllic fantasy town to a run-down fantasy backwater, this is a great place to explore. Dismals Canyon is an attraction that is best visited at night, as it is home to a type of glow-worm that uses bio-luminescence to attract its food, offering up a stunning light show to those who make the journey to this rural part of the state. Known as Dismalites, these creatures emit a bright blue-green almost neon colored light to attract their prey, which is beautiful for those fortunate enough to visit. Just north of Mobile, this town was the settlement of a group of slaves that had been captured and imported into the United States despite slavery having been outlawed over fifty years prior to their arrival in 1860. This town is now preserved, as it is where these slaves, after achieving freedom created their own settlement. The descendants of this group of West African people still live in the area today, and the heritage of the settlement's history is memorialized in the area, where a local project continues to document the work in the area and the unique self-governing village. Dothan is a town that is proud of its role within the peanut growing industry, and outside the local visitor center, there is a huge peanut, which is painted in gold and symbolizes the agricultural heart of the town. While it is huge compared to other peanuts, it is still only a few feet tall, but this is the first of 44 peanut sculptures that are located around the town, which make for a good family treasure hunt if you are looking for an interesting way to pass an afternoon. A very tenuous link to the former president, a cabinet within this McDonald's restaurant commemorates the day in October 1984 when Reagan stopped by for a Big Mac, fries and a sweet tea. Although the restaurant was bulldozed and rebuilt, there is still a bronze bust of Reagan in an alcove near the bathrooms, along with a plaque commemorating his visit.